Wales is a country that is part of the United Kingdom, bordered by England to its east, and the Atlantic Ocean and Irish Sea to its west. Wales has a population estimated at three million and is officially bilingual; both Welsh and English have equal status and bilingual signs are the norm throughout the land. For the majority English is their only language, although the once-steady decline in Welsh speaking has reversed over recent years, with the total of Welsh speakers currently estimated to be around 20% of the population. During the Iron Age and early medieval period Wales was inhabited by the Celtic Britons. A distinct Welsh national identity emerged in the centuries after the Roman withdrawal from Britain in the 5th century, and Wales is regarded as one of the modern Celtic nations today. 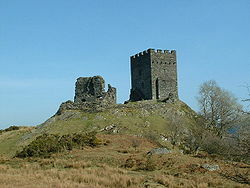 In the 13th-century, the defeat of Llewelyn by Edward I completed the Anglo-Norman conquest of Wales and brought about centuries of English occupation. Wales was subsequently incorporated into England with the Laws in Wales Acts 1535–1542, creating the legal entity known today as England and Wales. Distinctive Welsh politics developed in the 19th century, and in 1881 the Welsh Sunday Closing Act became the first legislation applied exclusively to Wales. In 1955 Cardiff was proclaimed as the capital city and in 1999 the National Assembly for Wales was created, which holds responsibility for a range of devolved matters. The capital Cardiff (Welsh: Caerdydd) is Wales's largest city with 317,500 people. For a period it was the biggest coal port in the world and, for a few years before World War One, handled a greater tonnage of cargo than either London or Liverpool. Two-thirds of the Welsh population live in South Wales, with another concentration in eastern North Wales. 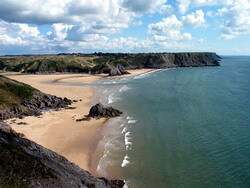 Many tourists have been drawn to Wales's "wild... and picturesque" landscapes. From the late 19th century onwards, Wales acquired its popular image as the "land of song", attributable in part to the revival of the eisteddfod tradition. Actors, singers and other artists are celebrated in Wales today, often achieving international success. Cardiff is the largest media centre in the UK outside of London. A holiday to Wales offers you the chance to experience many different things and a vacation to the principality can be made even more special by a day's horse riding. There are riding schools - offering ponies and horses - situated throughout the this part of Great Britain, giving you the opportunity to explore each part of the Welsh landscape in the saddle. Horse riding in Wales can be compled in large groups or individually and there are treks in the mountains, forests and on the coast to choose from. Expert riders are provided to lead groups on horseback, while families should always check the individual packages because there are various age restrictions at Welsh stables. Wet and windy weather may also have an effect on where you can ride, so be sure to check the forecast before you travel to your horse riding facility of choice. 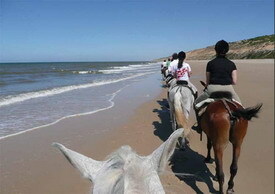 Beach rides are definitely worth experiencing as they give you the opportunity to ride in glorious surroundings. Taking the reins on the sand may evoke images of the famous Guinness advert from years gone by as you will feel like you are riding the waves as your trusty steed splashes through the surf. Pendine Sands in Carmarthenshire is one of the beaches where you can take part in such an experience day - and you may find this is the perfect spot for your whole holiday. Not only can you trot, canter or gallop until your heart's content right on the shore's edge, but you will have incredible views of this beautiful coast line, which is home to a wide array of birds and other flora and fauna. Once you are off your horse - the typical beach rides last for around two hours - you can investigate the scenic Brecon Beacons National Park, in which the Black Mountain and Fforest Fawr Geopark can be found. Here, you can discover spectacular waterfalls, tranquil rivers and luscious green areas - it is an ideal setting for a walk in the fresh air. It is also possible to see Wales's most famous mountain range on horseback, as there are a number of riding schools and stables around the Snowdonia National Park region. One isolated town is Betws-y-Coed, which is situated in the heart of a park area that boasts acres of intriguing moorland and deep valleys. Why not jump on a horse and get close to nature with a scenic ride through this stunning terrain in the shadows of the largest mountain south of Scotland, Mount Snowdon? About the Author - For experience days including beach rides take a look at ActivityWales.com. Book up your horse riding in Wales now.